Steven Sobolik is a Principal Member of the Technical Staff at Sandia National Laboratories in Albuquerque, New Mexico. He is a mechanical engineer by degree, obtaining his Bachelor’s and Master’s degrees from Texas A&M University. He began his career at Sandia in 1984, performing high-velocity impact tests at the Sandia rocket sled track. 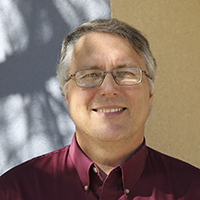 Since 1995 he has specialized in computational and experimental geomechanics, applied to rad­ioactive waste repository projects such as the Yucca Mountain Project and the Waste Isolation Pilot Plant (WIPP); underground oil storage caverns in salt formations for the US Strategic Petroleum Reserve (SPR); CO2 sequestration, wellbore integrity, and other underground storage and geomechanical projects. He has authored or co-authored numerous papers on the mechanics of salt as they relate to the storage of oil, gas, and radioactive waste, and is a frequent presenter at international conferences on rock and salt mechanics. He is a member of the American Society of Mechanical Engineers, the American Rock Mechanics Association, the American Geophysical Union, and the Solution Mining Research Institute.